Title Generator - Secret to Create Great Titles in Seconds! Who else spends hours together thinking for a catchy title that can go viral? How about getting a title for your next blog post or an article in seconds? It's no joke, you can get an amazing title in seconds with the help of the title generator tool. The Ultimate Guide To Digital Marketing etc. Great isn't it? Remember, titles catch the attention of the reader and may help in getting more visitors on your site, decrease the bounce rate and increase the time on page. Superior topic titles spellbound the user to listen to your business. I hope you got my point here. This tool is provided by TweakYourBiz and created by Liam delahunty. You can access the tool here. 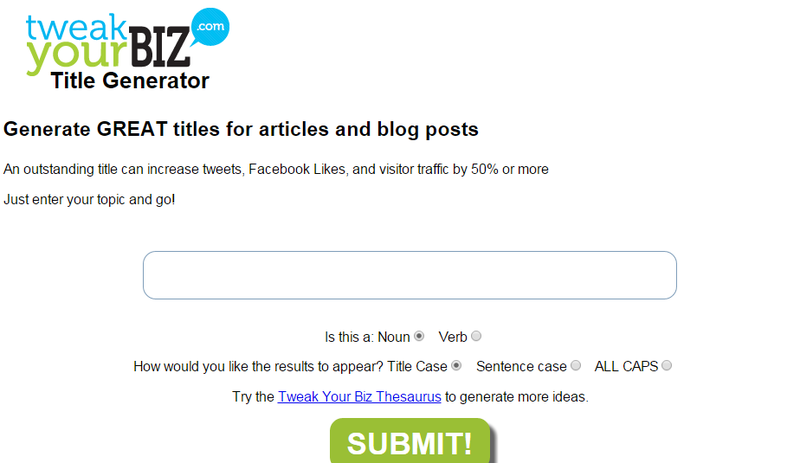 Portent Title Maker - The most amazing content idea generator, I have come across. Buzzfeed Title Generator - Get awesome ideas straightaway. No need to enter any topic for suggestions, just press "click to generate" and you are done. Now, you know the secret how the journalists and big media writers think of their titles? SHHH...someone is listening!